Almost exactly two years ago, we had the opportunity to take a short drive in the new Audi S5. We genuinely enjoyed the car, and so did you. 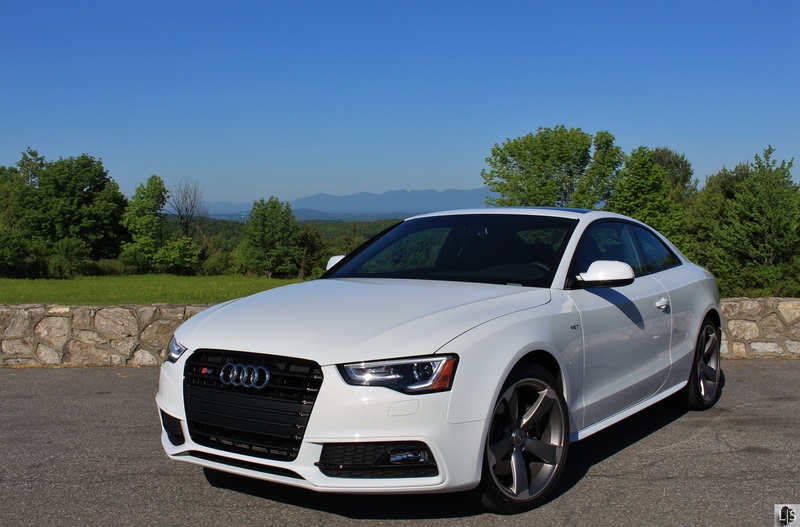 Our review of the 2013 Audi S5 is the most-read post in Limited Slip Blog history! 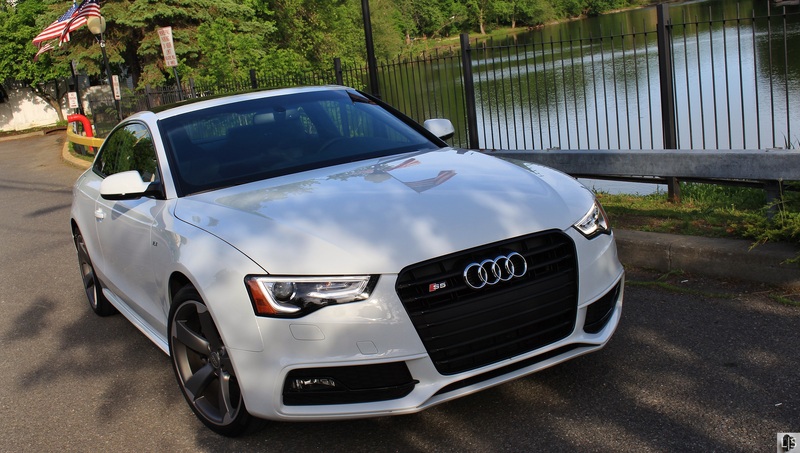 So when we asked Audi for a car to attend the Greenwich Concours d’Elegance and they offered us a 2014 S5 , we knew we had a winning combination. The two-hour ride to Greewich involved a long stint down the Taconic State Parkway, a road known to test both comfort and performance. That should give us plenty of time to reacquaint ourselves with an old friend. We invited a friend of the blog and his S4 to join us. After all, two Audis are better than one! Not much has changed since the S5’s refresh. For 2014, Audi Drive Select is now standard on the S5. That means adjustable steering, throttle response, and exhaust sound. More settings are available for cars equipped with optional features like the seven-speed S tronic dual-clutch transmission, adaptive damping suspension, or the sport differential. Visual changes include a new optional interior trim and the Black Optic package. Similar to the Titanium package in years past, the Black Optic package includes 19″ Titanium finish wheel, high performance summer tires, body-color side mirrors, and gloss-black window trim and grilles. We’re partial to the simplistic look and easy cleaning of the 5-spoke wheel design. Our tester arrived in shimmering Glacier White metallic with all the new visual options. 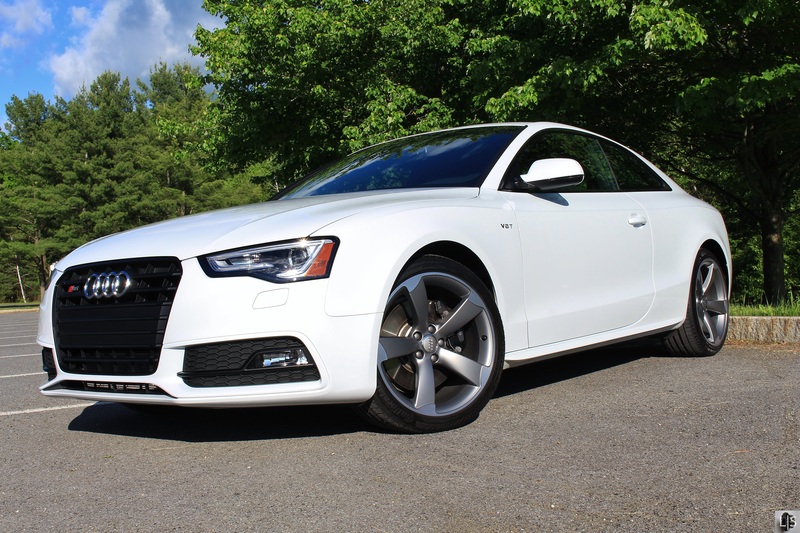 The contrasting white body and dark trim/wheels gives the S5 an aggressive demeanor. Unfortunately from afar, the black grille and color-matched mirrors make the S5 virtually indistinguishable from the A5. Inside, the exorbitantly expensive layered aluminum/black wood inlay gives the interior a “cheap suit” vibe. Save $600 and option the more-appealing Carbon Atlas trim instead. We were thankful to see the S5 equipped with the sport differential. This $1,100 option is a must-have in our opinion. It has more impact on driving dynamic than the equally-priced adaptive damping suspension. Audi’s MMI system with navigation and park assist rounded out the option list. Even with a short option list, the S5 stickered for a hairs breadth shy of $60k. The S5 platform has remained largely unchanged after the replacement of the 4.2L V8 with the 3.0L supercharged V6. Even with the new powerplant and corresponding facelift, the chassis and interior didn’t receive major updates. Inside, the S5 still feels up-to-date in both layout and quality. That’s a testament to Audi’s ability to design top notch interiors. Small changes keep the S5 competitive after 7 years; the flat-bottom wheel, the metallic accents on the switches, and the red ring on the Start button to name a few. The leather seats with Alcantara inserts were supremely comfortable and supportive. The extra “grip” from the Alcantara kept everyone planted in their seats. Only the S5’s technology showed signs of age. After re-wiring our brains rotate the MMI interface knob in the opposite direction, (as compared to every other interface on the planet) it’s very easy to use. But the novelty of integrated Google Maps has worn off. Couple that with T-Mobile’s poor network coverage and we were left disappointed with the navigation system. The S5’s audio system also sounded lackluster compared to other non-upgraded offering we’ve heard from some of its competitors. Powering down the parkway, the S5 is smooth and sure-footed. 333 hp and 325 lb-ft torque flow readily from the supercharged V6. Aural excitement requires the exhaust set to Dynamic. The V6 rumble transitions to a quad-tipped blat as the engine reaches its 6,500 RPM redline. Audi’s 6-speed manual features exceptionally short, precise throws and quick clutch uptake. The low-end torque and easy-to-modulate clutch mean an accidental 3rd gear departure doesn’t end in a stall. With a 0-60 time of 4.9 seconds, the S5 is plenty quick for daily use. Solid anchors can drag all 3,858 lbs of S5 to a stop quickly and confidently. The only flaw in the experience came from the S5’s steering. In every mode, there was a notchiness just off-center. Past that point, there was good weight and decent feedback. It’s clear that driving is the main focus of the S5 and it kept us coming back for more. 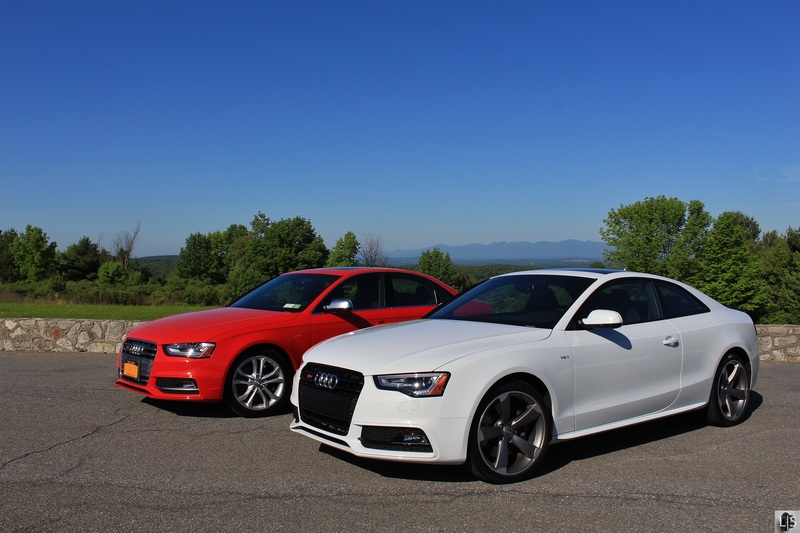 Transitioning off the parkway, following the contours of the Hudson River Valley exposes the S5’s primary weakness. Most of the V6’s weight lies in front of the rear axle. This makes the S5 nose-heavy. Audi’s quattro system keeps all four Continental tires gripping at their best and the sport differential keeps understeer at a minimum. But as the corners tighten, the front weight-bias can be felt pushing the nose out. In most cases, staying in the throttle will send the outside wheel more power, holding everything in check. It’s difficult to fight physics and the S5 isn’t as quick to change directions because of it. But it wasn’t serious enough to dampen the fun of tearing up the country roads in tandem with a Misano Red pearl S4. All this roadway frivolity didn’t have a huge impact on efficiency either. Over 475 miles, the S5 beat its EPA average and returned 21.7mpg. The pair of Audis arrived in downtown Greenwich and immediately fit in with the concours crowd. 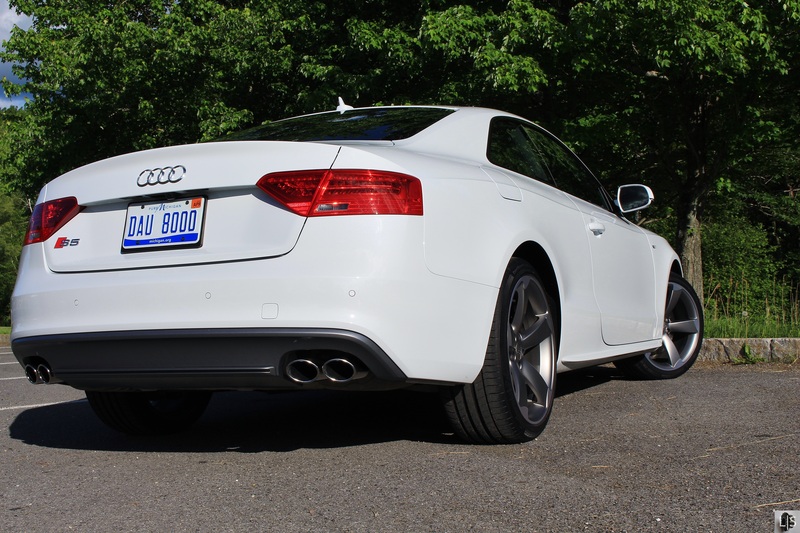 Enthusiasts and other Audi owners showed great respect for Audi’s S cars. It wasn’t all perfect, however. Good luck explaining the “V6T” badging to questioning onlookers. We would have also liked to retract the S5’s sunroof on such a beautiful, cloudless day. Ultimately, the S5 turned out to be the perfect car for the job. It provided an entertaining ride without making us uncomfortable. Just make sure everyone has a chance to finish eating breakfast before the fun begins.